Muriel's Wedding (1994). Collette plays Muriel (and sometimes Mariel), a young Australian woman stuck in the dead-end town of Porpoise Spit. A die-hard fan of ABBA, Muriel decides that the only way she'll fit in with the popular girls who routinely reject her is to get married. Family tensions and a desperate search for a husband ensue, with touching, often hilarious, consequences. Don't miss Rachel Griffiths in her film debut as Rhonda, Muriel's quadriplegic new friend. Velvet Goldmine (1998). Though TC doesn't have a major part, she shines as Brian Slade's (Jonathan Rhys-Meyers) ex-wife, Mandy. Gotta love Haynes' homage to David Bowie and Iggy Pop (and of course, who can resist J R-M and Ewan McGregor?). 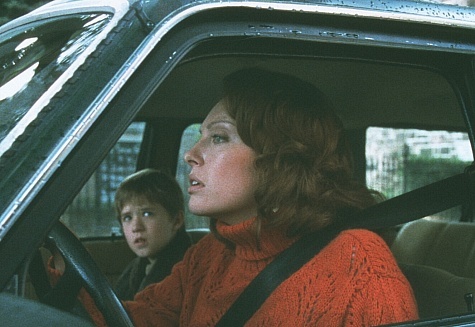 The Sixth Sense (1999). Collette received her first Oscar nomination (hopefully the first of many!) for her role as the over-worked mother of that kid who saw dead people. She covered up her Aussie twang with a Philadelphia accent and held her own against Bruce Willis and little Haley Joel. 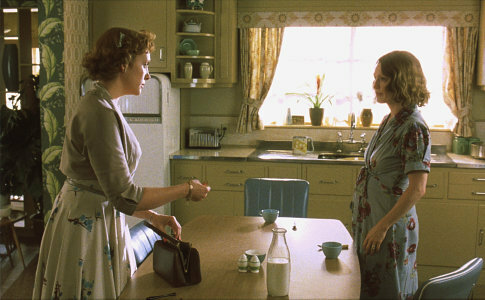 And finally, The Hours (2003). While she only has a supporting role, TC's Kitty Barlowe provides a crucial arena for the audience to learn more about Julianne Moore's Laura Brown (and yes, she gets to kiss JM, which prompted PCC's friend L to exclaim 'oh god, more lesbians!'). Collette is perfect as the vulnerable, yet wary woman who seeks more than friendship from Moore, but isn't quite ready for what she receives.